In absolute crap weather conditions, two U.S. Coast Guard helicopter crews were dispatched to Jumbo Mountain, 39 miles west of Ketchikan, Alaska on Prince of Wales Island: a charter plane with 11 passengers was reported to have crashed. After making the flight to the purported crash site, battling wind rain and poor visibility all the way, the Coast Guard arrived at the crash site and reported in: all 11 souls on board, while battered from a rough landing on the side of a mountain, were very much alive. Commander Michael Kahle, of the Coast Guard in Juneau, Alaska, congratulated the aircrew of the MH-60 Jayhawk helicopters who conducted the rescue. "Cases like these exemplify the versatility of our aircrews and how capable they are to expertly perform rescues from the ocean or even mountainsides," he said in a statement. 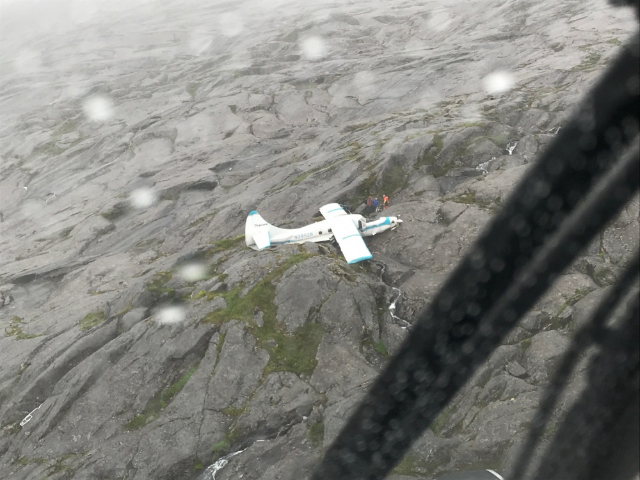 Coast Guard spokesman Charly Hengen told local media that the rescue pilots had only about a quarter mile of visibility due to fog during the mission. The pilot at the stick at the time of the accident was 72-year old Mike Hodgins, flying for a charter company called Taquan Air. The NTSB is investigating the accident, but in the meantime, damn: a plane crash on the side of a damn mountain where the plane comes out largely intact and all of the passengers survived? It might come out that the incident occurred due to pilot error but, in the meantime, I want a grizzled vet like Hodgins flying all of the planes, all of the time.